One of the Atlantic Puffins standing atop the rock on Bird Island in Bonavista Bay in Newfoundland, Canada has a lot to say to his companions as he squawks out orders regarding their nesting grounds. The rest of the Atlantic Puffins do not appear to be listening as some look off in the other direction while others sit and scratch their plumage with their large triangular bills. 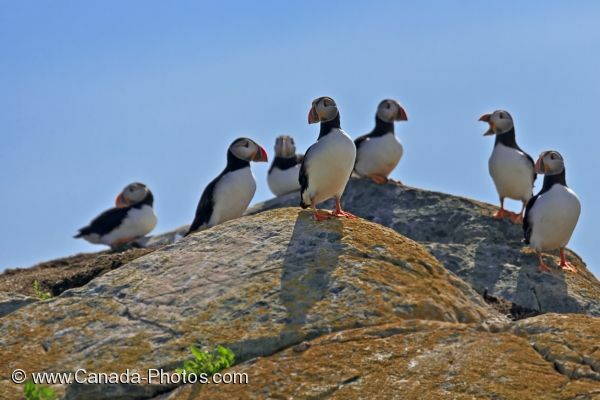 Picture of seven Atlantic Puffins at their nesting grounds on Bird Island in Bonavista Bay in Newfoundland, Canada.